One of the toughest moments in life is preparing to graduate high school. At the young age of eighteen, students are preparing to take a blind leap into what they think they’d like to do for their career. What can we do to make this leap towards a career a little less intimidating? The Kent Intermediate School District is making great strides in answering this question. Every year, on Groundhog’s Day, the Kent I.S.D. 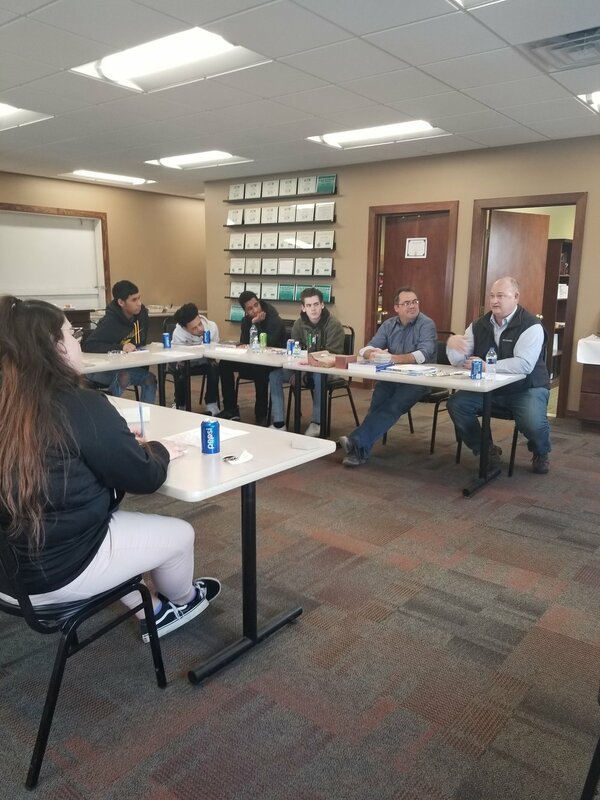 partners with local businesses and sends high school students out to job shadow. Welch Tile was honored, once again, to be one of the participating businesses. We had 9 students attend, who’s interests ranged from residential interior design to entrepreneurial endeavors. We wanted to show the students what it takes to complete a tile installation from beginning to end, so the day began with a presentation on basic design principals one may use when assisting a homeowner in selecting tile. We then began our project. The students were to design and install a 3-foot by 5-foot entry way. A 12-inch by 12-inch tile had been pre-selected and they were presented with three options for an accent tile. The design was up to the team! Before long, a beautiful pinwheel layout had been established. The students were then accompanied into the warehouse and, with the help of two gentlemen from our installation team, learned the in’s and out’s of an installation. From cutting with a wet saw to grouting, the students had a hand in the complete process. The day was concluded with a quick discussion of the paths that three employees, our designer, our C.O.O, and our President, had taken to get to where they are at Welch. It was a truly enjoyable day! To see the mock entry way the visiting students created, stop into our Kent City showroom, where it will be prominently displayed!